One of the key new features of iOS 8, which got unveiled more than a week ago, is the support for 3rd-party keyboards. Most of the developers behind the popular 3rd-party keyboards for Android, such as SwiftKey, Swype, Fleksy, and probably others, quickly announced that they are going to release versions of their keyboards for the upcoming version of Apple's mobile OS. But it seems that TouchPal just surpassed them all, as the developer behind one of the most popular keyboards with contextual word prediction and gesture input for Android just released a video demo of its custom keyboard for iOS 8. 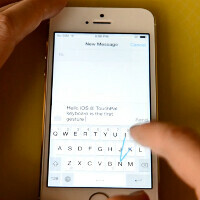 The brief video shows us TouchPal's keyboard running on an iPhone 5s that is apparently running iOS 8 – the user quickly inputs text by swiping their finger across the keyboard, just like one would do on an Android device. Apple's native keyboard in iOS 8, QuickType, will also up its game in iOS 8 – it will come with contextual word prediction and allows a fair customization, as users can easily adjust its on-screen size. All in all, it seems that things are about to get pretty hot on the keyboard front in iOS 8 this autumn. Without further ado, check out the first 3rd-party keyboard on iOS 8 in the video below. Wow! Amazing, best keyboard ever. I hope those androids won't copy this one. Ha ha have u completely lost it...... It is available for android when u were not even born... These guys make be believe that ifans are loser and loner. peace246 - uhh,do you even sarcasm brah? Haha POT MEET KETTLE EXACTLY LOL!! Droids act like Google invented everything. You know widgets were a 'thing' on the Mac OSX before Android even existed right? xD Predictive typing existed before smart phones. Apple's triumph isn't in inventing features, but on IMPLEMENTATION of those features in a better way than before. They didn't invent touch screens, but did think of multi-touch/gestures - scrolling, swiping. Everything that makes smart phones possible is thanks to Apple "re-inventing" of the touch screen. Apple re-invents technology and applies it in a practical way than used before. And that's what makes it 'revolotionary.' Touch screen on iPhones is much more responsive, maybe Ill use swype again - I never liked it on Android thought it was cool at first but then became annoying when it wasn't putting in certain words I didn't mean to type. Apple's predictive texting will be smarter than Android - distinguishing between an email and a text, your mom and a drinking buddy, or your boss... giving you different suggestions for each type of conversation that fit the tone! So they aren't just 'adding' prective texting, they're doing it better - and worth the wait. Too bad that hasnt worked out for Apple Maps yet. Apple strikes out at times too, they are not perfect. Speaking of which.....lets not forget the Apple Newton and Bandai Pippin. 2 massive failures by Apple. One would turn out to be the ancestor to the iPhone, iPad....the other.....just a massive failure. As far as what you posted....at this point in time .....as in 2014.... it doesnt deserve a direct response anymore. IMO. Looks great, hurry up fall 2014. LOL, only 5 years late. This is a great feature. It's the only way I type on my phone for the past 2+years. I'm so much faster and more accurate with it. Now only if they would fix the keyboard to change the letters when caps or not. Relying on a single stupid arrow is annoying. Wow, did I wake up in 2009? Lmfao Getting this features after 5 years Nonsense iUsers will say Apple will be the first and iFans will be so happy receiving this . Joke. Some iFans deny Android be the first on this thing. Apple invents the widget first with their macbook they said. And now, they said iPhone reinvents it and does it better than Android. Worst troll ever.